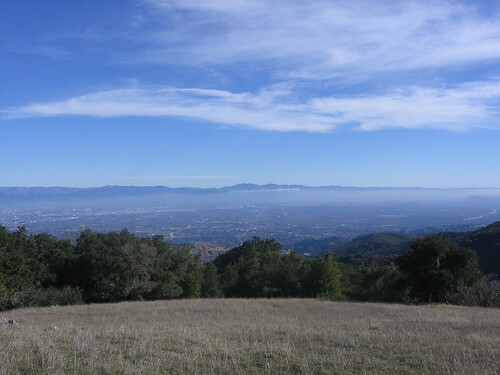 We’ve hiked six miles at Montebello Open Space Preserve and we’re resting up at a trail stop close to the parking lot. A philosophical discussion of Karma arises (nothing but the Deep Thoughts for us). 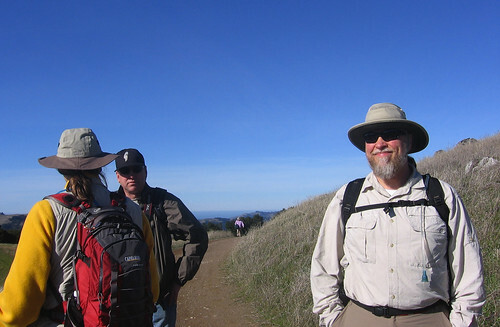 Steve Sergeant, organizer of many local Sierra Club outings, has brought along his friend Mark, who sounds like somebody who pushes ones and zeroes for a living. “So the good stuff I do cancels out the evil stuff?” Mark asks. Yeah, we explain. He likes the sound of this till Steve chimes in that the exchange rate is unpredictable and at times unhealthy (vengeful relatives, picky police officers, etc.). Talk soon turns to how many Hail Mary’s would be required to absolve certain transgressions. Now, the uncomfortable part where the alleged comic explains to his crowd why this is funny: One use of a Perl script is to automate repetitive tasks (another is to post these words to my blog). The idea of digitizing one’s prayers to Our Lord (“No reason I should have to repeat all those,” Mark says, to more laughs) is inherently humorous to people acclimated to the tech-drenched culture of the Valley. (Yeah, you really had to be there). Without further ado, let’s look at some pictures. The scenery at Montebello Ridge pales a bit compared to the snow-capped peaks of the High Sierra we saw on Sunday, but the absence of a 500-mile drive balances the accounts (there’s that Karma again!). Steve, at right, smiles into the morning sun (perhaps thankful he remembered his sun glasses). In the center is Tom C., one of the daring few who accompanied me to the top of Mission Peak before Sunrise on Thanksgiving Day. Dan Mitchell, who came up with the Turkey Day at Dawn idea idea, had to skip this hike at the last minute because of a family emergency. 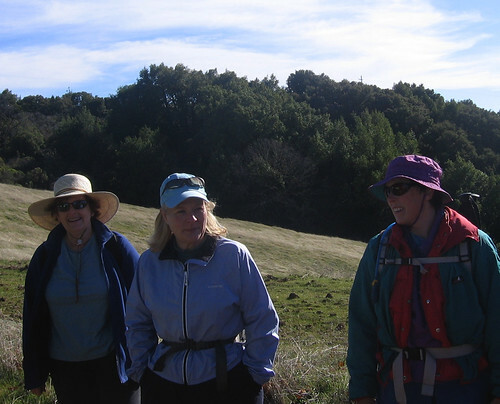 At left, with her back to the camera, is Cynthia, a San Jose hiker who continues to hit the trails every weekend despite reading about my adventures here every week. 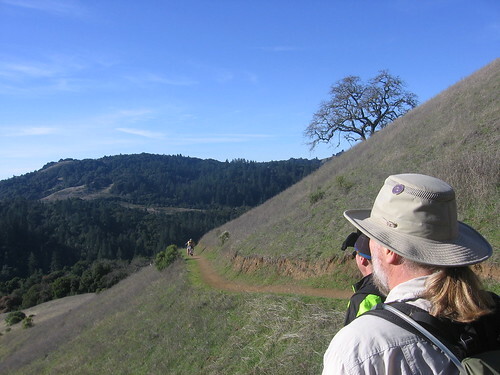 The main point of Monday’s hike was to have local readers of my hiking blog, Two-Heel Drive, get together with their fellow outdoorspeople for a few hours of fellowship and geeky humor. Three of them (Steve, Tom and Cynthia) took me up on the offer, so along with Steve’s wife, Jean, and his friend Mark, we had an even half-dozen, which is an ideal size for a group outing. We hiked about three miles to Black Mountain summit. 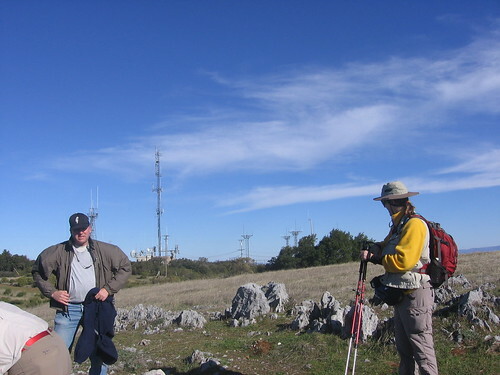 The fanny in the left-hand corner belongs to Steve, who is inspecting a summit marker left by the U.S. government to encourage Americans to increase their muscular flexibility by bending over to read the tiny type etched in the marker. 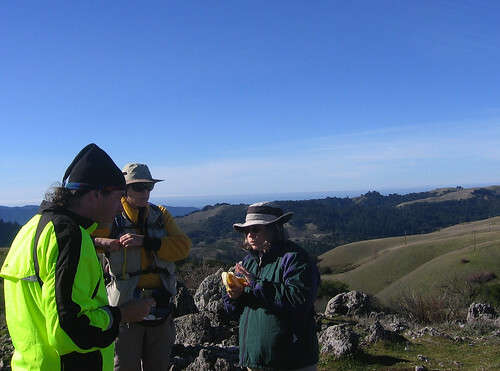 Mark, Cynthia and Jean have a snack at the summit. Somewhere down there, a hundred thousand geeks will return to their cubicles this week determined to invent the Next Big Thing — and outsource it to India. 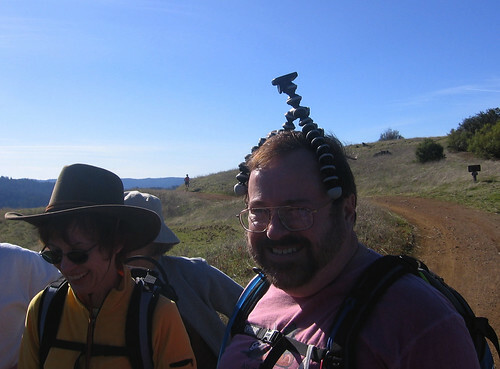 My other goal was to meet Mike and Kathy, the FOMFOK brain trust, on their annual First Hike. Mike demonstrates the proper use of a GorillaPod — a skull-mounted Web-cam! More FOMFOK regulars: Peggy, Joanne, Kristin. We exchanged greetings and they headed up towards Black Mountain to shout away the demons of 2007 that live up there. 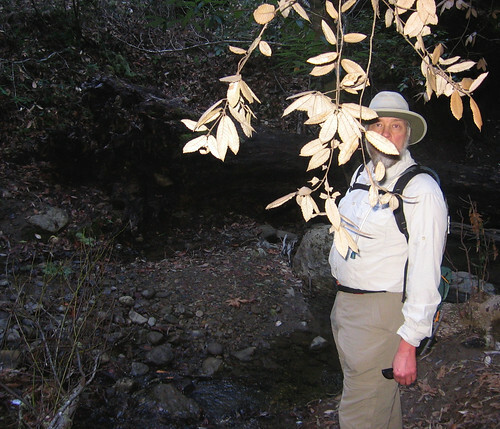 We set off down the Canyon Trail to the Stevens Creek Nature Trail, site of the San Andreas Fault. If an earthquake hit we’d have had some fun. 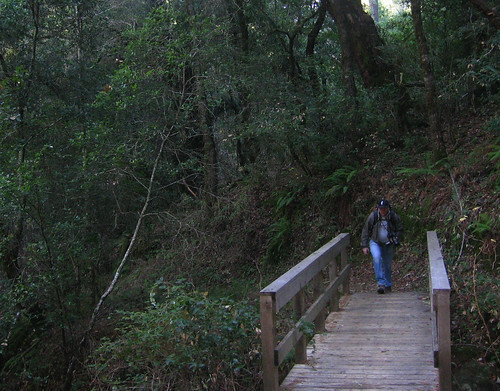 That’s Tom C. crossing the bridge over the fault (there’s a creek running through it). 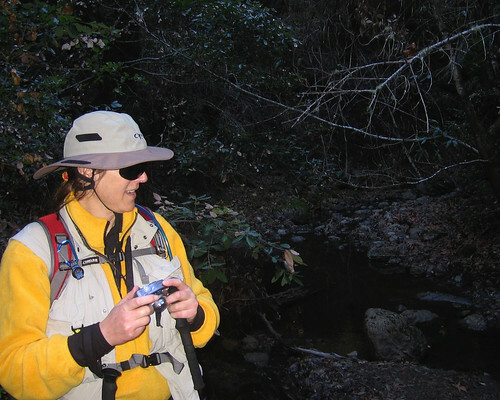 Electronic flashes do cool things down deep in these wooded ravines. Cynthia waits for her flash to warm up. All in all, a fine hike. Though if we believe in Karma we’re probably going to have to pay for it. First work day of the year is tomorrow, that should cover it. It took me awhile but I finally got my pictures and hike report up. It’s still a bit of a rush job but oh well.